hi-one of my favourite green smoothie hints comes from Robyn Openshaw’s book The Green Smoothie Diet. Using a permanent marker mark cup measurements on the side like in my photo. The numbers printed on the side of my blender are so tiny I can’t read them and it is so easy now to throw in 2 cups of water and the greens on top. This photo was taken just after I bought my BlendTec Xpress recently and for the first time I was able to put everything in unchopped! My first blender blew up back in Jan 2009 because parsley stalks and baby spinach had wrapped around the blades and the motor burnt out… so with the free replacement blender (the same model) I chopped up all the greens. After a year of GS’s and the blender starting to make weird sounds (I can’t cope/I can’t cope!) I decided to make the investment and buy a REAL blender. The BlendTec is amazing- now I can use more greens up to the top and frozen fruit. 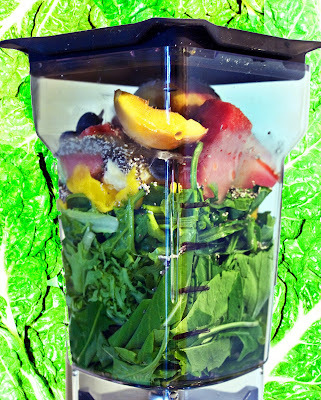 great post JD – would love to hear more about how the blendtec has heightened your green smoothie experience! i have the sunbeam 800 watt – and its fabulous. I got it at DJs for a absolute bargin ($68.00)so keep an eye out for the sales. Jane – what is the minimum watts for a blender. I found my works really well but still chop most things although i have to admit it does cut throught the frozen fruit beautifully. HI Ann-the minimum I think is 800 watts-and that it can crush ice. My BlendTec is 1500 watts -the difference is the speed and even though the blade isn’t even sharp it is the speed that purees everything to a super smooth texture. A positive is that the greens are really smashed and broken down for maximum digestion. A more powerful blender saves time as well because you don’t need to chop everything AND you can STUFF your blender! I bought this after a year of chopping stuff and drinking gs’s. If you start feeling the daily benefits and decide that you are going to be drinking them EVERYDAY for the rest of your life well that is the time you make the investment in a better blender. It is great to try out green smoothies first with your blender-which is the same wattage of a blender I used all last year so I know what you mean about the chopping. Here’s the place I bought mine- local-in Sydney. I can come over and give you a demo-Green Smoothies 101 ! -and make sure the boys are there too-they have probably seen this blender (or sim) on Will It Blend on youtube -but we are NOT going to be blending any old mobiles or walkmen!!!! Wow so nice! I like this site.Keep it working every day.